This vegan chocolate babka is sweetened with mashed banana for a version of a yeasted banana bread, with a silky chocolate ganache woven through the layers. If you’ve never made a babka before, it’s just a sweet yeasted cake-like bread – and this is a really good one. I moved this past weekend. I’m back at my parent’s place for the summer to spend some time with them and all the pets before we move in September. It’s nice, but a bit of a culture shock, too. I’m sure you don’t want to hear about moving (I don’t really care to write about it) but it went well as far as things like that go. I got a really lovely email from a reader a few days ago. She writes, “Your story really touched me; and as someone who also has struggled with depression all of her life, I’ve been changing my lifestyle bit by bit to keep my depression in check. I’m also doing my best to transition to a vegetarian diet.” So I wanted to write a little update on the topic (I last wrote about it here). I’ve been doing really well overall. I wasn’t taking my St. John’s Wort for a few days during this moving period and that, combined with the general stress, was making me really emotional and teary. I think we all have periods like that, and it’s good to recognize that people without depression experience that too, and not to let it bother you too much. It can be exhausting to be constantly fighting the symptoms of depression, but if you are depressed, I want you to know that it can get better. I am so much better than I was even last year. In terms of anxiety, since I started taking aconitum (I got it from a doctor in Germany, check it out if you live there) my attacks have virtually disappeared. I definitely find that if I’m not eating properly or exercising enough that anxiety starts to sneak back in, but I haven’t had an actual anxiety attack in a long time. Every time I get nauseous, though, I think that I am having an attack and sometimes get really shaky and weak because of it. It’s worse at certain times of the month too – you might want to keep track of that and see if your anxiety is worse around your period and try to plan for it. I also wanted to talk a little bit about how I view my diet these days. I’m not completely vegetarian. It was creating too much stress when I was living at home, as my parents aren’t particularly interested in vegetarianism, so I became a little less strict about it. I never cook meat, and very rarely eat it (and if anything, only fish or poultry). Graham and I never have any meat in the house, and I vastly prefer to eat vegetarian. Obviously everyone is different and some people wouldn’t be able to do that, but it was the best choice for me. I’m not one of those people who really craves meat and has really missed it, and I don’t like eating it now. That being said, however, if its eating a small piece of fish or dealing with huge amounts of stress by not eating it, I will eat the fish. I’d say my diet is 99% vegetarian, and I think that 1% is totally okay. I’m just writing this to say that if you are depressed, or have severe anxiety, that you shouldn’t beat yourself up about having the perfect diet. It can create more problems mentally than it solves. Chocolate is good for mental health problems, too, right? Like in Harry Potter? I had a bunch of overripe bananas and didn’t feel like making muffins, and yeasted banana bread, i.e. chocolate banana babka, seemed like it’d be amazing. It is. In the first test run of this recipe, I used too much yeast. I forgot that the sugar in the bananas would cause extra rising. The bread exploded out of the pan and was a total mess. Round two of this vegan chocolate babka had reduced yeast and a little bit less milk, and it was perfect. This recipe isn’t any more complicated that cinnamon buns, so if you can make those, you can make this bread. If braiding is a little out of your comfort zone, just roll it up and bake it that way instead. The chocolate filling is very simple. You could add a little cinnamon or cardamom to the bread dough if you’d like, but I really enjoyed it without the added spices. This is perhaps not the most spring-like recipe ever, but since there isn’t anything growing here yet anyway, I don’t care. My rhubarb is starting to peek up now. 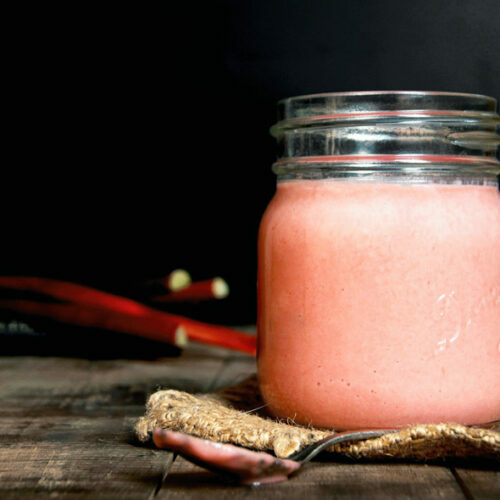 I did a whole series of rhubarb recipes last year, so prepare for much of the same, pals. 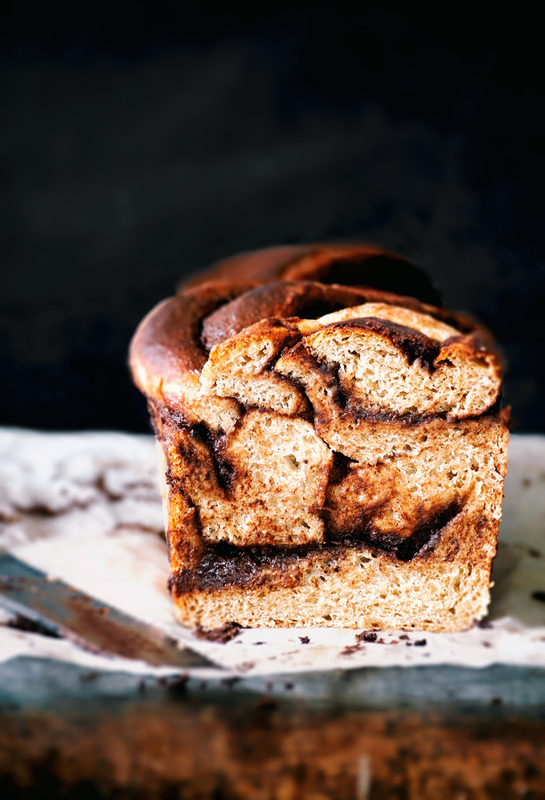 This chocolate babka is very tender, and very much like a babka despite being all plant based. There’s no added oil, and the bread is very low in fat. There’s a small amount of maple syrup in the dough but it relies mostly on bananas for sweetness. I decided to use primarily light spelt flour in this babka, but you could certainly try it with whole spelt instead and see how it turns out. I think this is my new go-to when I have too many overripe bananas. 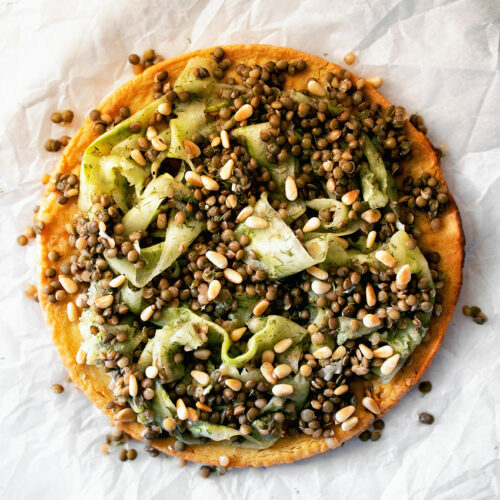 I have several other recipes using yeasted dough, so if this one seems like a little much, you can check them out instead. Bread is my absolute favourite thing to make. I’d happily write a book with just bread recipes. Chocolate babka is a classic but adding bananas really makes this special. 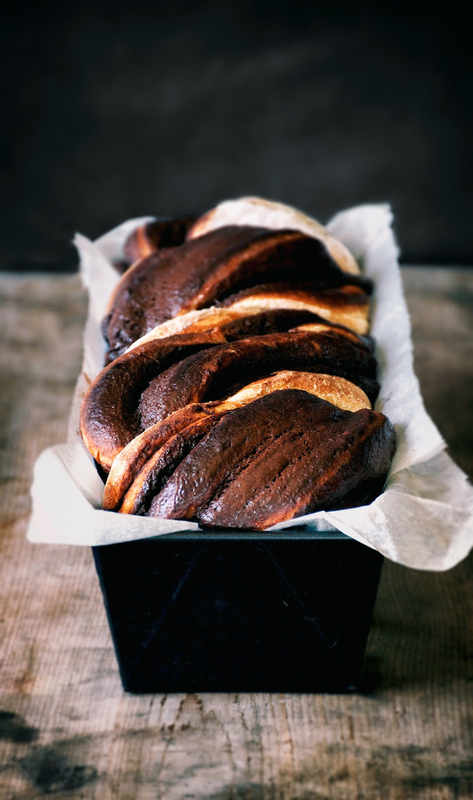 This vegan chocolate babka is sweetened with mashed banana for a version of a yeasted banana bread, with a silky chocolate ganache woven through the layers. In a large bowl or the bowl of your stand mixer, add the warm water and maple syrup. Sprinkle the yeast over top and let it sit for fifteen minutes to activate the yeast. If it's not foaming up, throw your yeast out and get some new stuff. Stir in the mashed bananas, milk, maple syrup, salt, and vanilla powder. Add the sprouted spelt and stir with a wooden spoon or the stirring attachment on your mixer. Add the light spelt flour 1/2 cup at a time, stirring until it becomes too difficult, at which time you can turn it out onto a well floured surface and start kneading by hand. Use your dough hook for this step if you're using a mixer. Continue kneading and adding flour until a smooth, soft ball of dough forms. If it's too soft it'll be too hard to plait. Place the dough into a large greased bowl, cover it with a clean kitchen towel, and let it rise in a warm place for about an hour or until doubled in size. Prepare the ganache while the dough is proofing. Line a bread tin with parchment paper. I used a long, narrow tin, but a standard one will work just as well. You might need to bake it for an extra five minutes if your tin is quite wide. Once the dough has risen, generously flour a clean surface and set the dough onto it. Roll the dough out to about 3 cm thick and so that one side is the same length as your bread tin. Spread the ganache over it. Roll the dough up from the side that's the length of your tin (like a jelly roll), then cut it lengthwise. Make an X with the two strands of dough, and then gently wrap each over the other until a plait forms. Gently pick the dough up and place it into the lined bread tin, tucking any messy ends underneath. Cover again and let it rise for an additional thirty minutes. While the dough is rising again, preheat the oven to 375F/190C. Bake the bread for 40-45 minutes, or until the top is golden. Melt the dark chocolate in a glass bowl over a small pot of boiling water. Don't let the bowl touch the water. Once all the chocolate has melted, whisk in the coconut cream, vanilla, and salt. Cover and place in the refrigerator to cool until you're ready to use it. There might be some extra leftover, depending on how much you want to use in your bread. If so, just eat it with a spoon or use it to ice cupcakes. I chose the spoon route. 1. I used traditional yeast. Rising times will be a little faster if you use quick yeast. 2. Full-fat coconut milk will result in a slightly denser bread. Opt for a lower fat milk, like cashew or almond, for a more pastry like bread. 3. You can also use dark chocolate chips. 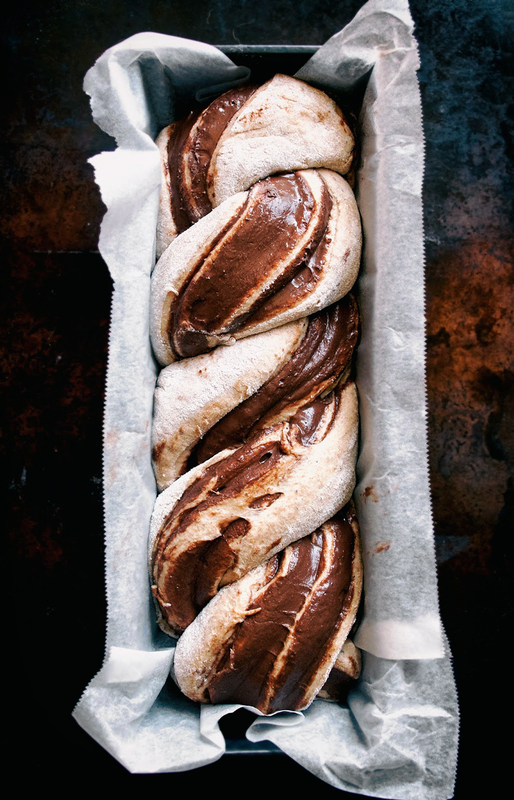 Mmm… what a great combo of flavours for a babka! And so cool that you used bananas IN the dough and that it worked out so well. will have to try that sometime because I *always* have overripe bananas in the house! This babka is beautiful! I'm of polish decent, so I love a nice piece of babka!! Im glad this version is healthy! Thank you, Hannah! I love banana bread, but yeasted banana bread just takes it over the top. I think a good, balanced diet is so important for everyone – caring for your mental health is something we should all be doing, whether we have mental illnesses or not. I'm glad that you've been able to find that perfect balance. Thanks!! OOooh Alexandra.. so much here.. but that babka is totally distracting me! WOWH! Soo happy you're feeling good and your meds are helping. Depression is very challenging to navigate with it's twists and turns, triggers and pure exhaustion. I'm so sorry your dealing with it. I know of it because of a family member… it is a hard road. You're doing so much to help yourself, though. Yoga, eating well and exersise go a long way to support a better life with depression. And you're meditating too? I know that is also a big support. Thank you for sharing your story with us, Alexandra. Yay YOU on this babka! It is stunning and beautifully executed! 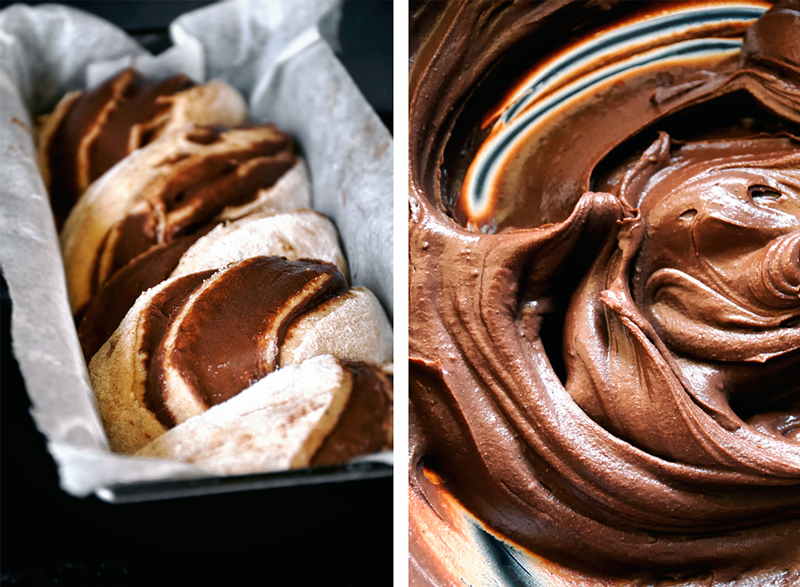 I've never made babka with melted chocolate… oh my it looks luscious! And I never imagined making it with banana!! Mind Blown! You're tempting me… it's been too long since I've had a good babka! I hope you like it, Keith! Would this recipe work with regular flour? Hi, Sara! It certainly will, and it'll even be a bit more forgiving than if you used spelt flour instead. I've tried both ways and it worked great with all-purpose flour. I made this on the weekend – I have to say it's the most amazing bread I have ever tasted! Never would have thought to make a yeasted banana bread – and then to add in chocolate ganache totally makes it over the top! 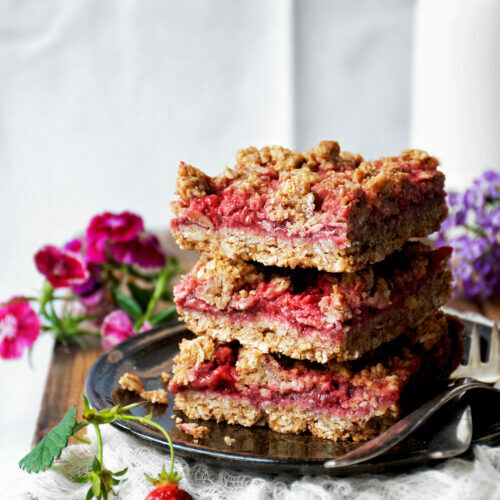 My new fave – thanks so much for the amazing recipe! I'm so happy to hear that, Erin! Thank you for your kind words! hi….this one seems so tempting….would appreciate if you could make video for this recipe. Hmm, I'll have to try that, thanks for the suggestion! The photos and post are so lovely, Alexandra. And the crumb's texture looks just right! 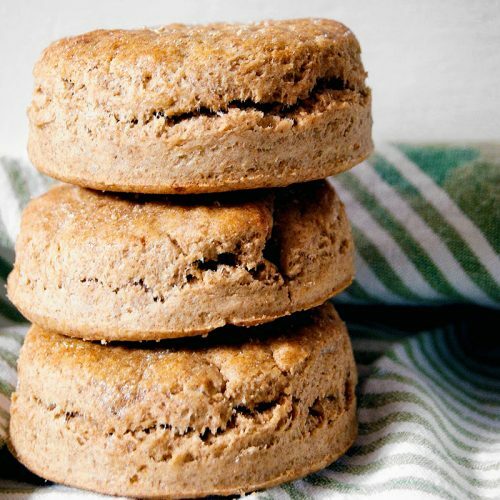 Spelt flour and ripe bananas is a special combination. I make a spelt banana bread and sweeten it with honey and applesauce. Reading your recipe, I bet maple syrup would work, too. Looking forward to trying my hand at this babka. You can use just about any kind of sweetener in its place. If you can use honey, that's my favourite substitution, but whatever you have on hand will work. A liquid sweetener would be best. can we use normal all purpose flour instead of spelt? You definitely can! I have made it with all purpose flour and it turned out perfectly. I'd like to devour it right now but bevore I've got a question. I'm on gluten free diet so how can I replace gluten flour to non gluten? I would apreciate your advice. Hi Karolina! Unfortunately I'm not an expert on gluten free yeast breads, but I think a gluten-free flour blend (like from Bob's Red Mill) might work as a substitution for the spelt. I did find one gluten-free babka recipe online but it uses whey as part of the flour mix. However, I have seen gluten-free cinnamon rolls that have good reviews, and you could follow the recipe for something like this just for the dough: http://www.forkandbeans.com/2014/03/13/best-gluten-free-vegan-cinnamon-roll/ and then continue with this recipe once you have your base dough prepared. Sorry I couldn't be more help, but I hope it goes well for you! wow! This looks Ridiculously amazing in every way. Thank you for posting this! Would this work with real dairy milk or would that require any changes? I haven't tried this exact recipe work dairy milk but I don't see why it wouldn't work! It might even be a little easier to work with.